For thousands of years, Indian brides have traditionally used a special concoction from head to toe on the eve of their wedding to get skin glowing for their big day. The sheer vibrancy of this liquid gold is almost enough to make a believer of anyone doubting the powers of this DIY face mask. The key ingredient? Turmeric. Not only is it one of the healthiest--and tastiest--ingredients to incorporate into a diet, but it's actually also got a brilliant place in skincare as well. High in antioxidants, it makes perfect sense that this ancient spice could slow cell damage, exfoliate, and act as an anti-aging antidote. With more than two dozen anti-inflammatory compounds, turmeric can help soothe skin from acne, dryness, and even eczema and psoriasis. 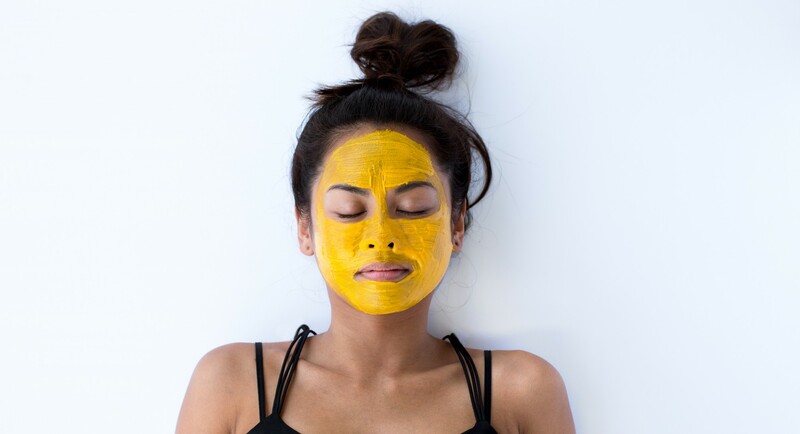 For this time-honored and tested beauty mask, combine turmeric with two potent, also edible ingredients. Yogurt contains lactic acid that can dissolve dead skin cells, in addition to zinc, a known acne fighter. Raw honey is naturally anti-bacterial and contains beneficial enzymes and probiotics. This trifecta makes a face mask that's a seriously obsession-worthy skin saver. Tie your hair back and put on an old throwaway T-shirt--turmeric can stain. Apply the mask directly onto the face, including the undereye--you want the brightening, tightening benefits there for sure. (But of course, be super careful to avoid direct contact with the eye.) The gorgeously golden hue of this mask will leave you breathless. Concerned it might stain your skin? There's nothing to worry about--after leaving the mask on for 15 to 20 minutes, gently scrub it off with a washcloth and the only visible glow should be your natural one. If a little color does linger, swipe it off with a witch hazel-infused cotton ball. Still fearing the prospect of heading into work looking like a smiley face? Try the mask in the evening, and 12 hours should be plenty of time for skin to regenerate to the point of shedding off any residual color. Wake up as radiant as a bride on her wedding day--for real.